The most popular alternative to incandescent bulbs is compact fluorescent lamps (CFLs). They have become the poster-child for how the average consumer can help stop global warming, but these bulbs present a few environmental challenges. Consumers must be informed of the toxic mercury content in CFL bulbs and proper cleanup procedures in case of accidental breakage. A special collection system is also required to ensure that they do not contaminate waste streams and end up in landfills. As You Sow filed a shareholder resolution with General Electric (GE) in 2009 requesting the company begin labeling their CFL packaging with information on mercury content and safe clean up instructions for broken bulbs. After our engagement with the company on the importance of providing this information to ensure the safety of their CFL using customers, the company began working with the National Electronics Manufacturers Association (NEMA) to move the industry on this issue. 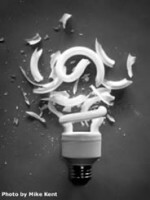 In 2010, GE and NEMA successfully urged the Federal Trade Commission (FTC) to expand its jurisdiction to include mercury labeling and to require that all CFL packages contain a link for consumers to learn how to safely clean up if a bulb containing mercury is broken. The special clean-up information can be found on the EPA website.